Salmon is a wonderfish. It helps your brain, your skin, your cardiovascular system — just about everything in your body benefits from salmon of the wild variety. To mix up weekday lunches, I cook it ahead and add it to salads. This week’s salad features roasted bell peppers, asparagus and shallots served with lemon-dill wild salmon on a bed of mixed greens. Here’s the recipe — one of the easiest in the world — but so good I must share. Remove salmon from refrigerator to bring to room temperature. Place fillets on a plate and drizzle with lemon juice and sprinkle a generous amount of rough chopped dill on each. Chop all vegetables and toss in a bowl with 3 tablespoons olive oil, salt, pepper and garlic. Arrange on baking sheet and roast in 350 degree oven for 45 minutes. Heat one tablespoon of oil in pan on medium heat. Once warmed, place salmon fillets skin side down on heated pan. Let cook for 3 minutes, turn and let cook for another 2 minutes (or more if you’re not a fan of lightly cooked salmon — but do not overcook). Remove from pan and drizzle again with lemon juice. 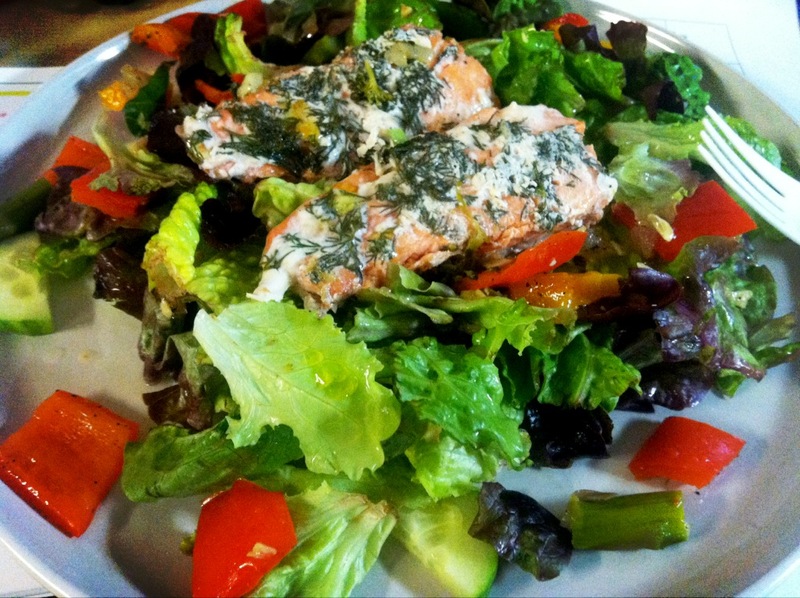 Add roasted vegetables and salmon to mixed greens and drizzle with lemon juice, olive oil and lemon pepper. Simple, delicious, healthy. My pizza obsession and general gluttonous nature has afforded me the opportunity to find one of the best pies known to man — and to tell you all about it. Potato pesto pizza — it’s not only an alliteration, it’s a complete contradiction to everything you thought about pizza toppings. Stay clear, carb counters. 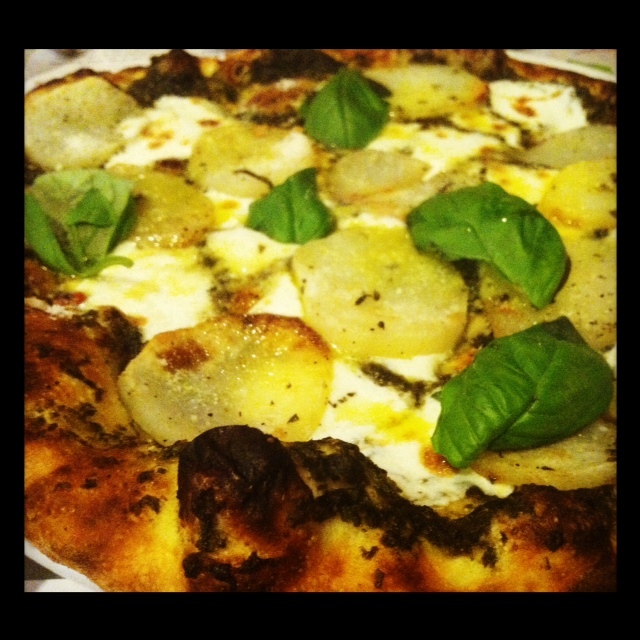 This pizza comes with 1/4-inch thick slices of perfectly cooked, sliced white potatoes layered atop high-quality mozzarella, homemade pesto and topped with whole basil leaves. Contrary to my first thoughts, the pizza crust was strong enough to hold its hearty toppings, meaning I could enjoy the slices the way pizza should always be eaten — with my hands. I’ve never fell in love with a slice so quickly. After my first bite, I proclaimed I would be coming back. Soon. The second bite drove me to announce that this potato pesto pizza was one of the greatest pies I had ever experienced in my many years living with a pizza obsession. It rivals Toby’s Public House, Grimaldi’s and Celeste. I was hooked. I was in love. I almost cried. As if the pies alone weren’t reason enough to make the trek to Astoria Boulevard, the service there is friendly, funny, flirty and 100% Italian. And at 9pm on a Friday night, there was no wait. I struggled with the decision to tell the world my two readers about Basil Brick Oven Pizza. But in the end, I could not keep it to myself. This pizza is too special. It needs to be cherished, respected, praised. It needs to be eaten. Traveling for work means eating out all the time. And sometimes it’s crap, making me miss even the oft-made-fun-of Lenny’s Pizza right below my apartment, or worse, the fried chicken place next to Lenny’s (sorry, Dan!). It’s true, New Yorkers are spoiled when it comes to food. But while I was in DC (National Harbor, Maryland, technically), I stumbled upon a place called Rosa Mexicana, a (gasp!) chain restaurant. This area is depressingly touristy and I was less than excited to spend my per diem at such a kitschy place, with its bright red and green decor begging for passing travelers to spend some time inside. I fell for it. And I’m glad I did. 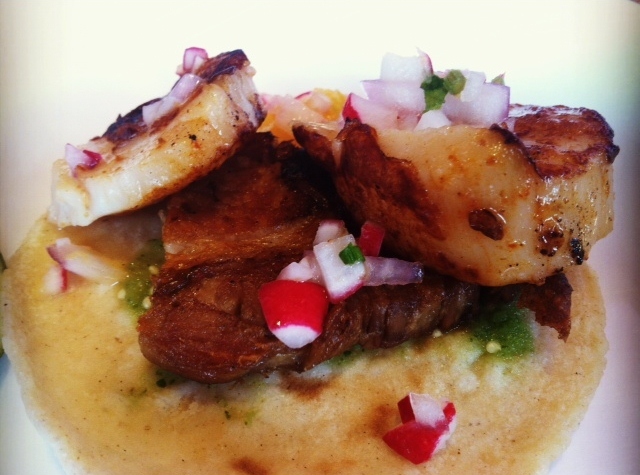 For starters I had pork belly and sea scallops tacos served with citrus-habanero salsa (above). These things were riduculously good. There was a generous portion of perfectly cooked pork belly and the scallops were seared nicely. The fruity sauce lightened things up a bit — a nice balance in both taste and color. For my main dish, I chose from the single-page menu of month-long specials, which happened to advertise Jonathan Waxman as the culinary advisor to the cozy cantina. 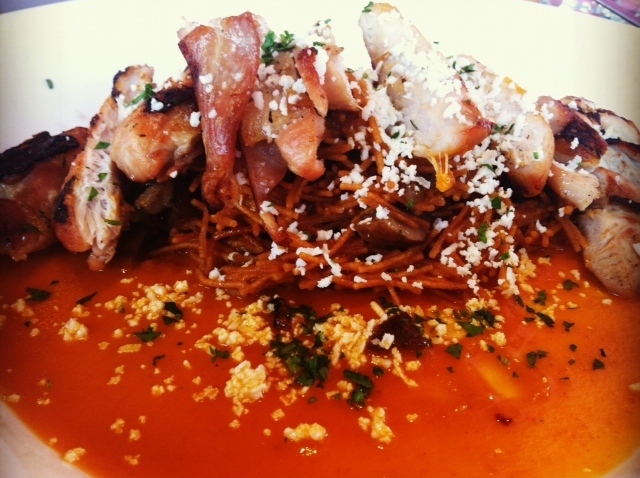 I went for the Conejo con Fideos, or flash fried pasta with rabbit, chicken, habanero chili roasted tomato salsa, portabello mushroom and scallions. Ever since my rabbit experience at Al Di La, I’ve been fantasizing about the subtle but delicious white meat. This dish was interesting in a good way. Though not each of the pieces of rabbit looked too appealing, there were enough to quench my rabbit desire. The sauce was light and the pasta itself was thin and delicate with a slight crunch. This monster of a dish actually came with sides: A bowl of rice and scallions along with a bowl of black beans. Though the atmosphere of this restaurant may be a turn-off, the food is no joke. At least at this location. And we can probably thank Jonathan Waxman for that. As my friends know, I’m obsessed with grilling. Unfortunately, grills in New York City are a rarity. Unless you live in Queens, I guess. They have yards there. But I do not. And I hold grilling to a higher standard than cooking over cheap charcoal in a $20 Hibachi on the fire escape. Luckily, I have friends in suburbia who have the space for grills…and me. This recipe screams summer. 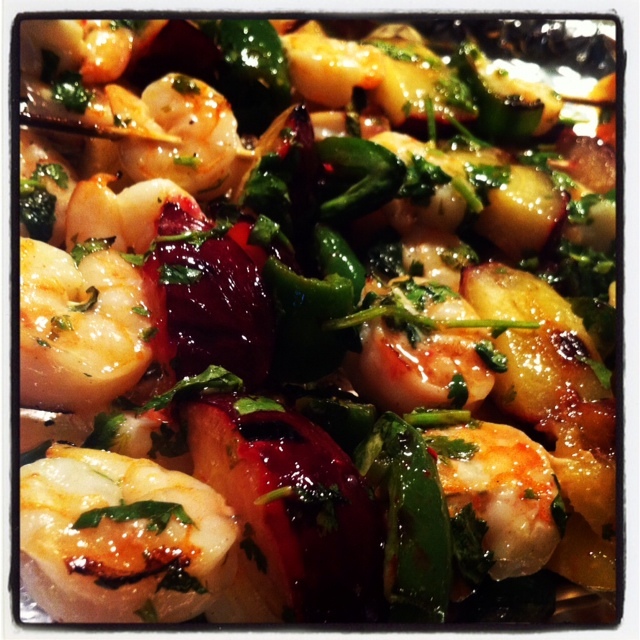 And though you may find it odd to pair plum, jalapeno and shrimp (as I admit, I did), this dish is a sweet and spicy surprise. Grill it now! It’s been a while. So I apologize to all two people who read this blog. I’m back! I hosted a casual dinner party at my apartment last night. 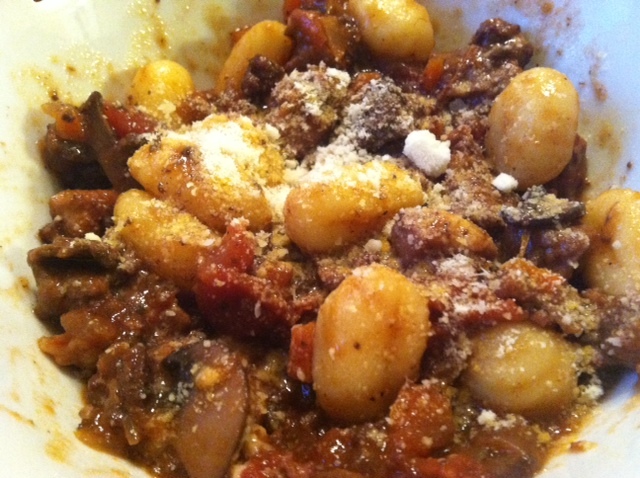 On the menu was a pork and wild mushroom ragú served over gnocchi. The recipe, sent from the food gods at Bon Appétit, was time consuming, and I loved every minute of it. It’s a zen-like moment when you’re in the kitchen with criminis sautéing in garlic and oil, pork bits browning in the dutch oven, porcinis soaking in hot water and a towel thrown over your shoulder. Heaven. I made the ragú the day before and let it sit in the fridge overnight for the flavors to meld. I suggeset that for anyone attempting this recipe. On the evening of the dinner, I just put it on the stove and let it simmer for a couple of hours until the sauce thickened, while I drank wine with my guests, which included Wheat Free Sarah (I made rice pasta for her), Sarah S, Jo Laff and Roommate. They all had seconds of this very heavy meal, which means they either starved themselves for the ensuing porkageddon or they loved it. I’ll stick with the latter. 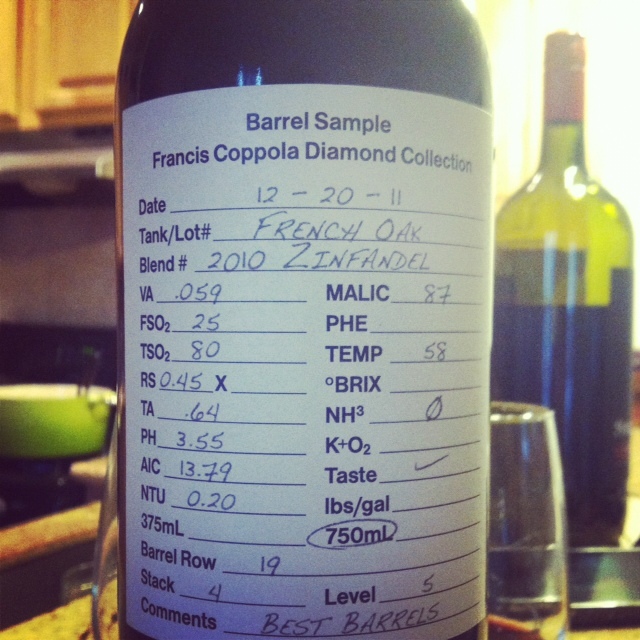 We paired it with this ridiculously good bottle of Coppola, thanks to WFS herself.